The first round of the 2005 D1 Drifting season got off to a stonking start. Not exactly the most local venue for myself, I still managed to travel the 300 or so miles to the track at Watergrasshill, just 10km outside Cork City. It was clear to see that the track looked much larger in the photo than it actually was. It was also narrower than I imagined which made it all too easy to end up in the deep gravel trap at the first corner. Several cars ended up being stuck there throughout the day! It wasn’t long before we were out on the practise runs, and everyone was approaching the track with caution. Thankfully the weather stayed dry – at least one less thing to worry about! As the qualifying runs approached so did the anticipation – more speed, more angle and typically more spins. Sixty entrants where whittled down to a mere twenty, with the top sixteen of that selected to qualify for the next day’s competition. Having travelled so far, it was great that all the entrants from the North, myself included, got through to the Sunday finals. The first of the guys from NI to arrive at the track was Dave McNeill. Competing in his Sierra Saphire Cosworth he had some bad luck in his final laps and had to retire from attending the Sunday event due to turbo problems. Richard Bradley was down from County Tyrone in his drift prepared, ex-police Senator 24v. He arrived rather at the last minute and the Senny was barely off the transporter and out onto the track. Even though the car had an intermittent misfire problem Richard still breezed the qualifying selection between swapping leads and plugs! I also wasn’t free from problems with the Skyline detonating slightly under severe load on the track. I have attributed this to bad fuel, miles out ignition timing advance and too much boost. 5psi for me on Sunday! And with the qualifying behind us the chosen 14 D1 licence holders went out for their practice runs. Alan McBride had arrived earlier in the morning with his ex-Julian Smith M3 engined E30, in usual good form out on the track. Mark Luney the final NI competitor for the event was also out but pouring smoke from the exhaust and an engine bay covered in oil meant things didn’t look good for his R32 Skyline. An oil breather catch tank rigged up from a Lucozade bottle among other things meant he could at least try and compete! And so onto the Sunday event, and the mechanical dramas continued. Mark’s car was guzzling oil, Richard’s Senator was running like a dog, and I had less horsepower than a lawnmower. 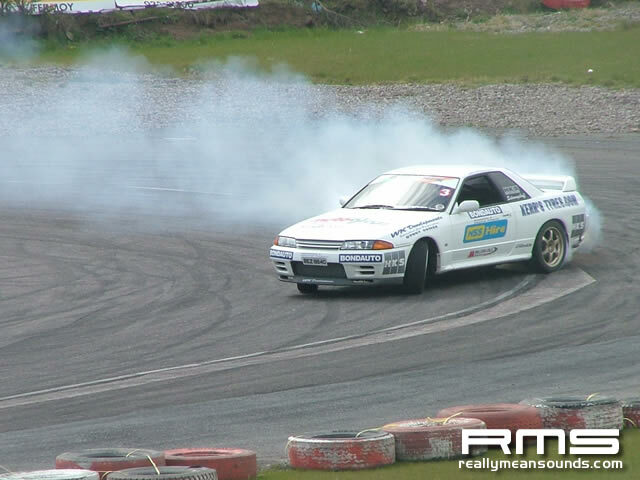 We weren’t the only ones, and Buttsy’s borrowed R33 Skyline bent a steering arm on one of his runs. We all still stuck at it, but only Mark and Alan made it through to the top 16. The Tsuisou (twin drifting) was awesome stuff as expected. 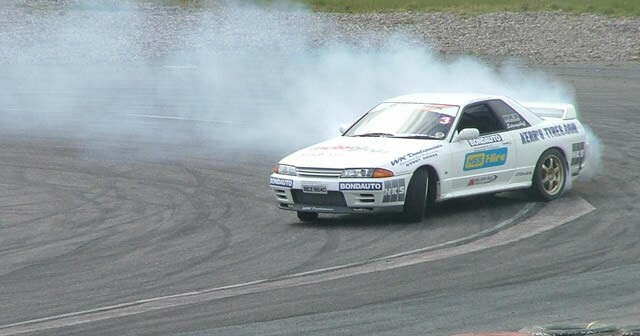 Ian Coyne definitely wins the showboating award in his silver R33 Skyline – he was rarely straight on any section of the track though his qualifying and ended up coming a close second to event winner, Damien Mulvey. Mark also had a tough fight on his hands against Jonathon Murphy and took fourth, with Jonathon taking the third place spot.